You’re considered an International student if you are a citizen of a country other than Australia or New Zealand. Interested in Accounting and Finance? Develop the expertise to succeed in the fast-paced financial and accounting sectors with an internationally-recognised Business School. With access to industry knowledge and hands-on learning opportunities, you will graduate prepared for a global career in the dynamic business environment. Learning from experienced academics and industry professionals, you will gain a desirable skillset recognised by employers including communication, teamwork, reporting and analytical skills. You will also understand how external and global markets can affect organisations and use state-of-the-art technologies to identify, analyse and interpret financial information. An undergraduate double degree in accounting and finance will enable you to pursue multiple career paths, or roles that combine these complementary disciplines. You can graduate with two professionally accredited degrees in just four years and will also be eligible for membership with professional bodies, in both sectors. Our professionally accredited Masters qualifications in accounting, finance, and FASEA-approved programs in financial planning will prepare you to advance your career. You will develop expertise in critical and strategic thinking within a highly-regulated industry framework and strengthen your research skills under the guidance of experienced professionals. Our Business School is in the top one per cent worldwide1 and has been awarded an overall five stars for excellence in the QS Stars Ratings 2019. UniSA is ranked in World Top 150 in Accounting and Finance2. Study at the No.1 Business School in South Australia for graduate careers3. Study a Financial Planning degree approved by the Financial Adviser Standards and Ethics Authority (FASEA). Learn about the economic, legal and political influences that affect global business, and prepare for a career in accounting and business advisory. Gain a foundation of business knowledge combined with accounting, taxation, auditing, law and finance. Participate in an investigative study tour learning about the business practices in Hong Kong, China and Taiwan (undergraduate students). Participate in industry placements – we have more than 2,500 industry partners and over 60 university partners worldwide. Finance students can access our state-of-the-art IRESS Trading Room on campus, which includes a market data feed and financial analysis tools - the same technology used by the world's leading banks and investment firms. Our range of undergraduate business degrees include common core courses in first year – you can then specialise in a chosen area, change your major, add a minor, or and pick and choose from professional electives so you graduate industry-ready. 1UniSA Business School is one of just nine institutions in Australia and 180 globally to be accredited by EQUIS (from over 16,500 worldwide). EFMD, February 2019. 22019 QS Subject Rankings. 3QILT: Graduate Outcomes Survey 2016-18 – Full-time Employment Indicator (Undergraduate). Public SA-founded universities only. UniSA Business School is No.1 in South Australia for graduate careers1. Our strong real-world connections mean you can learn from researchers recognised as performing world standard in Accounting2. You can gain valuable industry experience before you graduate with access to internships, overseas exchange, study tours, professional development courses, Summer or Winter School intensives and more – plus we give you a longer break between semesters to make sure you have the time. 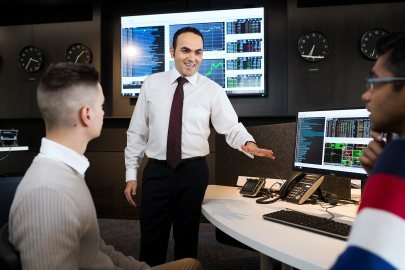 Finance students can experience the first state-of-the-art finance trading room in South Australia, providing a range of financial analysis tools used by the world’s leading banks and investment firms. Our qualifications are accredited and approved by leading professional bodies and we work closely with industry to ensure our curriculum includes the very latest theories and trends. Engage in our mentor program and be paired with an experienced business professional to enhance your network and career. Choose from flexible learning options to suit your needs and lifestyle including online, on-campus, full-time and part-time study. UniSA is ranked in the World Top 150 in Accounting and Finance3, our Business School is in the top one per cent worldwide4 and we have been awarded an overall five stars for excellence in the QS Stars Ratings 2019. We are consistently recognised and awarded for our excellence in teaching, the quality of our degrees and satisfaction of our students – there's never been a better time to study at the UniSA Business School. As a high achieving student, you may be a lucky recipient of one of our prizes or awards. 1QILT: Graduate Outcomes Survey 2016-18 – Full-time Employment Indicator (Undergraduate). Public SA-founded universities only. 22015 Excellence in Research for Australia (ERA). 32019 QS Subject Rankings. 4UniSA Business School is one of just nine institutions in Australia and 180 globally to be accredited by EQUIS (from over 16,500 worldwide). EFMD, February 2019. For select degrees, you can complete a bachelor and masters qualification in just four years. This unique offering allows you to fast-track your studies and graduate with greater expertise and career opportunities. Learn more. The University of South Australia is the first institution in South Australia – and one of the first nation-wide – to offer financial planning programs approved by the Financial Adviser Standards and Ethics Authority (FASEA). The financial planning profession has recently introduced new education standards, making it more important than ever to hold a recognised qualification. All financial planners currently working in industry will need to complete a FASEA approved program by 2024 in order to continue practising. New entrants to the industry will need to complete a FASEA approved program from January 2019. Our suite of degrees are designed to meet industry requirements and cater to all levels of experience and learning options, with the flexibility to study full-time, part-time, on campus, online, or in mixed mode. Master of Finance (Financial Planning): For those who hold a relevant prior qualification and are seeking to practice as a financial planner. This program is FASEA approved and can be completed in 1.5-2 years of full-time study. Graduate Certificate in Financial Planning: If you do not hold a relevant prior qualification but have industry experience, this qualification can be used as a direct entry pathway into our FASEA approved masters program. The graduate certificate can be completed in 6 months of full-time study. Bachelor of Business (Financial Planning): For those without a prior undergraduate qualification who are seeking to practice as a financial planner. This program is FASEA approved and can be completed in 3 years full-time through a mix of on-campus and online study. Bachelor of Business (Financial Planning) - UniSA Online: For those without a prior undergraduate qualification who are seeking to practice as a financial planner. This program is FASEA approved and can be completed in 3 years full-time 100% online. We also offer the option to study a bachelor or master's degree in financial planning as part of our 3+1 Pathway to Masters packaged programs, enabling you to fast-track your studies and enhance your career opportunities in just four years. An Accounting degree that takes your lifestyle into account. Study the Bachelor of Commerce (Accounting) on demand with UniSA Online. A 100% online degree designed specifically for online learning. We are a globally connected university with over 2,500 industry and professional relationships that support student internships, research and community engagement. Study at South Australia’s No. 1 university for graduate careers* and unlock your full potential. *QILT: Graduate Outcomes Survey 2016-18 – Full-time Employment Indicator (Undergraduate). Public SA-founded universities only. As the No.1 Business School in South Australia for graduate careers1, our quality teaching and experiences beyond the classroom will ensure you graduate career-ready. Auditor: ensuring financial and operational integrity and compliance; evaluating and reporting on financial, operational and managerial processes and systems; working on business process reviews and risk assessments. Investment fund manager: providing financial advice about investment matters such as buying and selling of trusts, shares and bonds; analysing data and available information to make decisions and recommendations about investments. 1QILT: Graduate Outcomes Survey 2016-18 – Full-time Employment Indicator (Undergraduate). Public SA-founded universities only. 2Australian Government Department of Employment, Occupational Employment Projections 2015. We are a globally connected university, our staff and students come from over 90 countries. We have more than 2,500 industry and professional relationships that support student internships, research and community engagement. Our Business School works with more than 200 companies, governments and organisations, and many of these are long-standing relationships built on common goals and shared values. In the 2015 Excellence in Research for Australia (ERA) rankings, our research in Accounting and Applied Economics was assessed as world-class. We have strong links, individually and collectively, with leading and like-minded research institutions in North America, Europe and the UK and are building equally exciting new relationships in Asia. Employment for auditors, company secretaries and corporate treasurers in Australia is projected to increase by 4,400 (or 22.3 per cent) by November 20201. Between now and 2020 employment for accountants, auditors and company secretaries in Australia is projected to increase by 17.1 per cent1. 193,489 businesses are in financial services, representing the economy's fastest growing industry1. No.1 in SA in Business, Economics and Law. Benefit from our commitment to excellence, quality teaching and world-leading research. Discover the world-class facilities that make UniSA a great place to study and research. Get assistance with finding long- and short-term accommodation in Adelaide. There are a number of ways to apply to study UniSA's undergraduate and postgraduate coursework degrees. You can access our online International Application System through our How to Apply page. The International Application System is an easy and secure online application and acceptance process. You will have visibility of your application through the secure online portal with the ability to download offer documents, submit your acceptance and make a payment. Alternatively you can submit an application through one of the University's registered Education Agents. If you are completing an Australian year 12 qualification in Australia or overseas, or the International Baccalaureate (IB) Diploma Programme in Australia, you must apply through SATAC http://www.satac.edu.au/. If you are applying for the UniSA Study Abroad or Study Abroad Plus program, you can submit your application online here. For information on applying to do postgraduate study by research, including Masters by Research, PhDs or Doctorates, please visit http://unisa.edu.au/resdegrees. There is no closing date for submitting your application however the admissions process takes between one and three weeks from the date that we receive your application and all required supporting documentation. If you are completing an Australian year 12 qualification in Australia or overseas, or the International Baccalaureate (IB) Diploma Programme in Australia, you must apply through SATAC. Key dates for applications can be found here. You may be eligible to receive credit or advanced standing for your chosen UniSA degree based on your previous studies, if they are in a related area at an equivalent or higher level. Receiving credit will reduce the number of courses you undertake within the degree, and may also reduce the overall duration of your degree. The amount of credit you may be eligible to receive is assessed on a case-by-case basis by the Admissions team. The best way to determine your eligibility to receive credit or advanced standing is to apply using our International Application System which can be found on our How to Apply page. You will need to supply detailed syllabus documents with your application. UniSA welcomes the opportunity to speak with you regarding your study options. Our staff are able to talk to you about degree information, career outcomes and pathways, entry requirements, applications, and student life, so that you are able to make the best study decision for your future. Click here to book a 1:1 appointment with one of our enquiries team. We also have many events throughout the year in Australia and overseas where you can speak with UniSA representatives about your area of interest. View our calendar of events in your home country by selecting the 'International' filter. At the UniSA Business School, you'll learn invaluable transferrable employability skills to future-proof your career. Hear from industry leaders and graduates as they discuss the importance of these skills in the workplace. I was able to participate in the mentor program, Chartered Accountancy achiever program and networking events within the university and accounting organisations. It gave me an insight into the industry and the skills I need to have when I enter the workforce. I enjoy studying at UniSA because of the world-class facilities, collections of quality study materials, student support services and quality lecturers, who hold a PhD, CPA, CA and more. The UniSA Business School provides you with the tools and education to prepare you for a career in your chosen field. I attended the Chartered Accountant Employment Evenings and participated in the Business Career Mentor Program which allowed me to learn first-hand from industry professionals who had previously walked in my shoes. The UniSA Business School's accounting degree has a strong emphasis on the importance of communication and teamwork. You need to be able to communicate technical concepts in terms that your clients can understand and action. Beyond the theoretical knowledge, I have found these skills to be useful when interacting and corresponding with clients and colleagues. As a financial planner, you must be prepared to work with a variety of people and be prepared to maintain your accreditation that allows you to compete with others in an industry growing and changing all the time. Having a FASEA-approved qualification is now imperative to a successful career as a financial adviser. The new FASEA requirements will effectively reshape Australia’s network of financial advisers. Financial planners who are able to adapt to change, continually learn new things, possess good communication skills, and demonstrate flexibility and resilience will be the most successful in their career. We have six campuses, a 24/7 online learning environment, and we offer flexible study options like online and evening courses.